Premium street machines are one of the most appealing segment in the Indian motorcycle industry currently. Most preferred bikes when under a strict budget includes these as they are marginally lighter and equally equipped as their faired counterpart. The infographic compares two upcoming premium street machines, both equipped with 150cc engines with liquid cooling and fuel injection technology. Suzuki GSX-S150 is the Asian lightweight Suzuki street bike, carrying a 147.3 cc engine producing 19.17 HP @ 11,000 rpm and 13.9 Nm @ 8500 rpm. It comes mated to a 6-speed gearbox and carries regular telescopic forks as its front suspension. The engine claims its maximum power at comparatively high rpm, making it ideal for those who love revving the bike hard and redlining every time they drive. It carries a fuel tank with 11 liters of capacity while provides a relaxed 785 mm of seat height. The availability of optional ABS makes it much more safer than its rival. The dry weight of the bike is 127 kg. Yamaha M-Slaz carries a 149 cc engine, producing 16.31 HP @ 8500 rpm and 14.3 Nm @ 7500 rpm. The real world accessible figures are far better for those who ride casually most of the times. It even comes mated to a 6-speed gearbox but carries a far better chassis and USD front suspension than the Suzuki GSX-S150. The design is even more effective while the wider set of tyres inspire more confidence while riding. The ground clearance is good at 164 mm while the high 805 mm of seat height can bother those with less than average height. The kerb weight of the bike is 135 kg. India is currently waiting for this excellent pair of rivals hat could take the expectation of buyers to another good level. 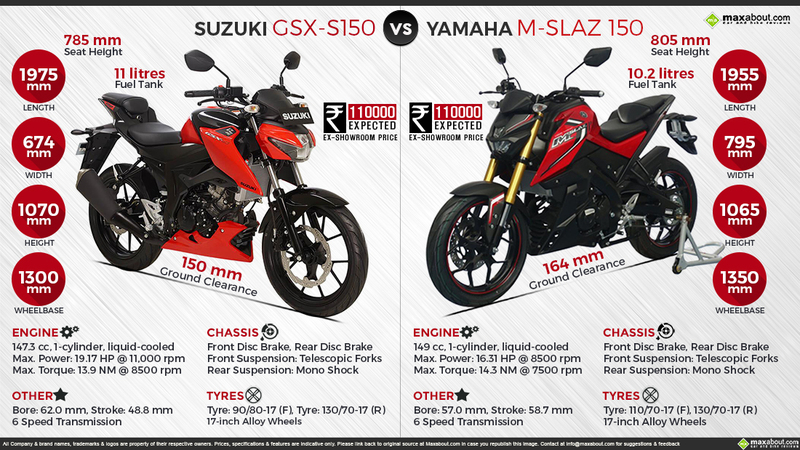 Currently, Suzuki offers Gixxer 155 in its naked lineup while Yamaha FZ-S is its rival from the Yamaha stable. Both the premium machines could enter India in 2017. Click here to know more about Suzuki GSX-S150.